Free theme, that based on 3 column home page layout with products slider and image slider on welcome page. Available in 10 colors. Choose your own one to make the front-end of your store attractive. 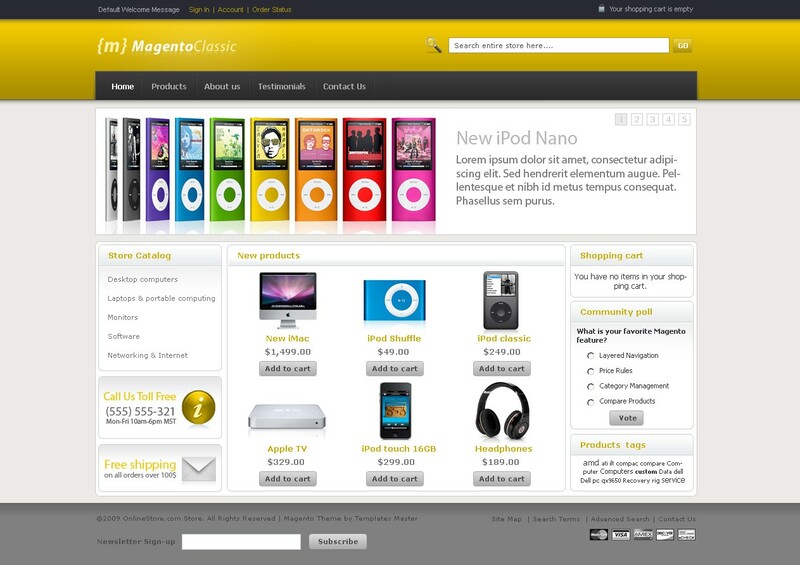 Find out more information and reviews about our template at Magento Classic theme page. 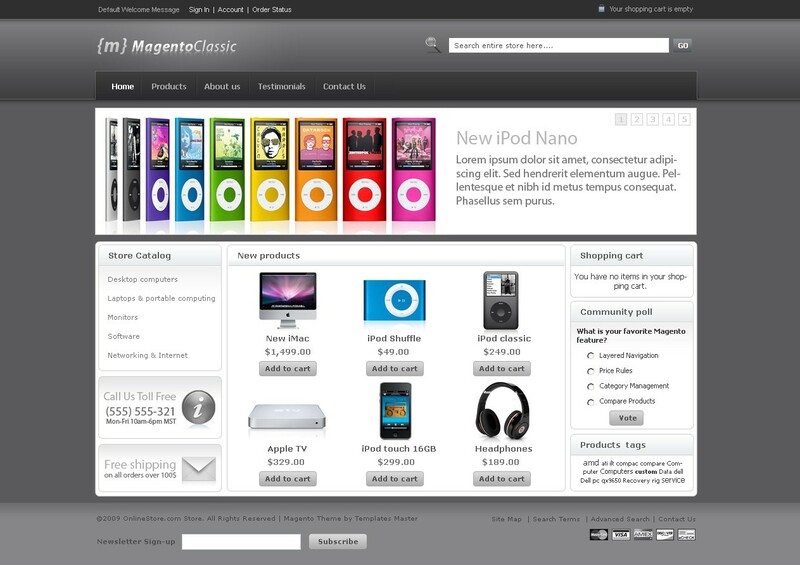 Try our free Magento classic template! If you are looking for universal theme for any kind of store, please try our Classic theme. The template was created to make your store user-friendly and easy customizable. Classic theme is commonly used by both small stores and well-established stores. So, this template is perfect solution to keep your store always afloat. Initial information and updates can be found at our official Classic theme blog post. The template is fully compatible with all Magento upgrades. Theme is available under Creative Commons License for commercial and personal use. Please buy commercial license if you want to remove copyright from footer or need any other service of ours. Theme is fully compatible with our free magento extensions. Please check complete list of our Free Magento modules. I've been doing some testing on a new VPS running Magento 1.9.0.1 and thought I'd load this theme as I'd previously used it. I couldn't get it to work initially, so lodged a ticket with Template Masters support to clarify whether 1.9.0.1 was supported. To be honest being a free template I expected to hear nothing back, but to my amazement they responded in 15 minutes and subsequently sent me their latest set of files which worked perfectly. This is a really amazing theme. This is a great theme for a small store like mine. $29 for a theme this nice is amazing. Magento is still a bear, but this theme helps tame the beast! My store (www.peekstuff.com) sells a handful of accessories for Peek Mobile Devices; not a lot of items, just a few cases, chargers, upgrade cable, etc. This template was perfect because you could have a small number of items and it didn't look empty. There is a install help file that teachs what we need to know. For a free template, this is the best one I've ever found. View all reviews for Free Magento Classic theme (available in 10 colors). Q: Nice Theme,The first day i Installed it i use to see the products on the home page, now i re uploaded the products but i can not get them at the home page.I would like to get my design exactly as your demo ! !What do I have to do ? A: Can you tell us if you set any product as new or featured in admin? A: Sorry but that isn't possible with default Magento tools. You should use module like http://templates-master.com/magento-products-highlight.html in order to show such block. A: This issue isn't related to our template but i think that you have some problem with Magento configuration. Our developers can review your site when it will be accessible online. Q: how can i remove the index.php on the url? A: You should simply go to admin > system > configuration > web and set Use Web Server Rewrites to YES. A: In case you want to use default position of categories in our template then you should simply remove that file app\design\frontend\default\f002\template\page\html\topmenu.phtml and refresh your store cache. Q: how can i add category on menu? Q: I installed it. it was sucessfull but page menus not working. A: Can you share link to your site so we can check what is wrong? Q: Hello, Do you still offer updates for new Magento versions? Like 1.9.1 :) Thank you! A: Yes sure, we will publish it this week. A: Sorry. I´m using "Free Magento Classic Theme". A: You should edit app\design\frontend\default\f002\template\page\html\topmenu.phtml and copy there default Magento code. A: We will release 1.8.1 compatible update within 1-2 days. Current feature will not work right now as it was modified with recent 1.8.1 release. Q: Hi: Thanks for this great theme, I have first question since I'm a newbie, how can I use only two blocks (left and content) and not loose the slider, because if I put 2 columns on home page the slider doesn't show. Thank you for your help. A: Please check information at http://templates-master.com/knowledgebase/index/view/faq/after-switching-to-2-column-main-page-layout-image-slider-dissapeared/. Q: Hi, Thanks for the template it is really good! I have a few questions though. - how do I add categories and subcategories in the navbar at the top (topbar) ? I only managed to have Home and Products... I have tried to change the code as mentioned in another post, but it didn't work... - Also, how do I make my categories appear on the left column of my category pages? - The links to the static block on the left hand side on the homepage(contact us and free shipping) link to the wrong page, where do I add/change these links? - In the admin, I cannot find the footer links on the right hand side (search, advance search contacts returns), I'd like to change themI'd like to buy the commercial licence to get rid off the copyright links at the bottom. Can I do that on a working website or will it delete all my settings and changes? After buying the licence, where can I remove these links?Thanks a lot! A: Question: how do I add categories and subcategories in the navbar at the top (topbar) ? I only managed to have Home and Products... I have tried to change the code as mentioned in another post, but it didn't work...Answer: Sorry but you can add categories in same way as in default magento template. Can you send us link to your store so we can check what is wrong?Question: Also, how do I make my categories appear on the left column of my category pages?Answer: Please check http://templates-master.com/knowledgebase/index/view/faq/ShowStoreCatalognavigationblockonallstorepages/Question: The links to the static block on the left hand side on the homepage(contact us and free shipping) link to the wrong page, where do I add/change these links? -Answer: You can change that links in catalog.xml file.Question: In the admin, I cannot find the footer links on the right hand side (search, advance search contacts returns),Answer: All this links are set via theme xml files.Question: Can I do that on a working website or will it delete all my settings and changes? After buying the licence, where can I remove these links? Thanks a lot!Answer: You can buy license whenever you want and simply remove link from footer then. 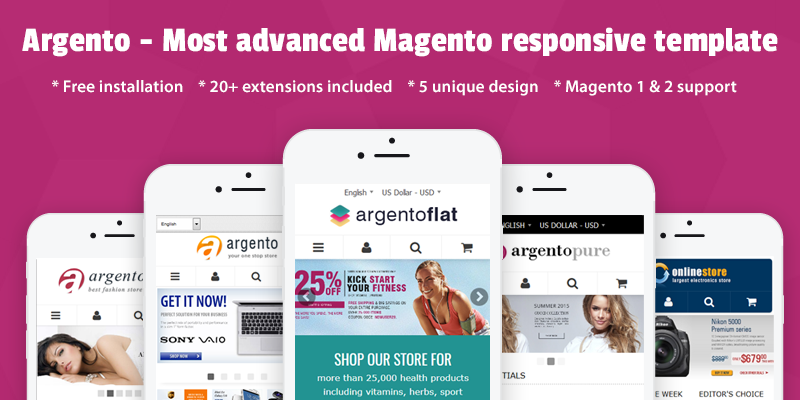 Q: I got magento message "Absolute and classic themes are now compatible with Magento CE 1.7.0.". I downloaded and used it on 1.6.4. What are the changes? Do I need to upgrade? I could not find any release notes? A: You can download 1.7 version from our store. It should be used only at magento CE 1.7. Q: I have bought the free version and now looking to upgrade to a commercial license. What is the process? After I have bought do I need to reinstall? A: No you don't need to reinstall. You can simply remove copyright link. Q: Is this working on 1.6.2.0? Q: How-to show all categories at the top level of the menu, instead of in a sublevel of "products" ? Q: I love the theme. I've been working around it for almost a week now. My only issue is that the price on the product description page is not showing up. There is another post on here that is having the same issue but there was no reply on how to fix it. Im on Magento 1.5 and with the latest template. Please help!!.. A: Most likely you are using older theme version. I would suggest to download this theme and update at least catalog.xml file at your store with recent file version. A: Please contact our support and send us screenshot of you problem. We have not faced this problem before.